Kampala 01 March 2019: The 15th Annual General Meeting (AGM) of the Regional Universities Forum for Capacity Building in Agriculture (RUFORUM) will be held at the University of Cape Coast (UCC) in Ghana from 2-6 December, 2019. It will be the first AGM to be hosted in West Africa following RUFORUM’s strategic geographical expansion in 2014 to include Universities in Benin, Côte d’Ivoire, Ghana, Liberia, Mali, Nigeria, Togo, Sierra Leone and Senegal. The 15th AGM will run under the theme: Delivering on Africa’s Universities Agenda for Higher Agricultural Education, Science, Technology and Innovation (AHESTI): What will it take? Africa’s efforts to attain sustainable and inclusive economic growth and development as enshrined in the Agenda 2063 and the global Agenda 2063 is at heightened levels. Accordingly, Universities in Africa have immense responsibility to translate these aspirations into products, services and competitive innovations. Higher education institutions are therefore at the centre of these processes in science, technology and innovation. The Africa’s Universities Agenda for Higher Agricultural Education, Science, Technology and Innovation (AHESTI) provides an operational framework for delivering espoused contributions of higher education to Africa’s transformation. Universities in Africa that will convene in Ghana will have the opportunity to deliberate on what it will take to translate the AHESTI framework into reality as part of unlocking the innate potential of Africa’s higher education institutions. This 15th AGM coincides with RUFORUM’s 15th anniversary celebration, a year after the ratification of the RUFORUM Vision 2030 Strategy and its Five year Operational Plan (2018-2022). During this AGM, RUFORUM will reflect and learn from its programmes implementation, and concretize on the directions and strategies for the realisation of RUFORUM Vision 2030 Strategy. This AGM is anticipated will be attended by about 400 delegates including Ministers of Agriculture and Education and their respective Permanent Secretaries, Vice Chancellors, Principals and Deans, partners and Heads of development institutions, private sector leaders, farmers and farmer representatives, emerging and early career researchers and young entrepreneurs from especially Ghana and other West African countries. Universities, private sector actors and young entrepreneurs shall have the opportunity to showcase their innovations, products and services, network and broker partnerships with one another. RUFORUM shall recoganise farmers that have made significant contribution to agricultural transformation in Ghana as part of supporting national efforts for the advancement and transformation of agriculture. RUFORUM shall also recognise scientists and other actors that have made significant contribution and supported the advancement of excellence in research and higher education for the development of Africa. This recognition will be undertaken under the IMPRESSA Awards. Young Innovators and Entrepreneurs from West Africa will be recognised as part of promoting the contribution of youth to economic growth and development of Africa and the need to provide youth with a platform to demonstrate their potential. A number of Pre-AGM Side events will take place and will include; Post-Doctoral fellows training, targeted skill enhancement training for University Principals and Deans, Leadership and management training for the Forum for Women Vice Chancellors in Africa (40 Vice Chancellors), Social media training for students from RUFORUM member universities in Ghana, a learning event on indigenous chicken production in Africa and a business and entrepreneurship training by the Institute of Business at University of Cape Coast for Young Innovators and entrepreneurs. The Regional Universities Forum for Capacity building in Africa (RUFORUM) on Friday 22 February honoured the former Commissioner for Rural Economy and Agriculture at the African Union Commission, Her Excellency Rhoda Peace Tumusiime, for her “Outstanding contribution and leadership in advancing agriculture and agri-business in Africa”. 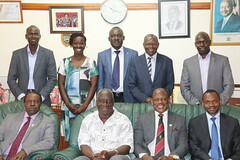 She was honoured during a courtesy visit to the RUFORUM Secretariat based at Makerere University. Among other career achievements at national, regional and international level, Rhoda Tumusiime was instrumental in championing the Malabo Declaration on accelerated agricultural growth and transformation for shared prosperity and improved livelihoods made by the Heads of State and Government of the African Union in June 2014. Speaking on receiving the award, Rhoda Tumusiime, an agricultural economist by profession, expressed her deep appreciation to RUFORUM and urged RUFORUM to continue on its current path to building capacity for agriculture in Africa. She acknowledged that the task ahead is big, but expressed optimism that with the dynamism and diversity of staff at the RUFORUM Secretariat, as well as the connections with member universities and other development partners, the Network is up to the task. During the visit to the RUFORUM Secretariat, Rhoda Tumusiime was also taken through an exhibition showcasing RUFORUM’s journey since its inception in 2004 through to its current strategy, RUFORUM Vision 2030. She commended RUFORUM on its expansion to a continent-wide network covering 37 countries and was elated to see that its programmes now include gaps areas like supporting student entrepreneurship and establishment of agribusiness incubation hubs. She informed that the Network is highly regarded in various international fora and recommended that it engages more closely with African governments and the African Union Commission. Since her retirement from the African Union Commission in 2017, Rhoda Tumusiime, a Ugandan citizen has resettled in her home country, but continues to lend her expertise to the cause of promoting agricultural prosperity and food security in Africa. She currently serves in key positions on national, regional and international organisations, including the Association for Strengthening Agricultural Research in Eastern and Central Africa, the World Potato Centre (CIP) and the International Fertiliser Development Centre (IFDC).